The rescue, foster care, and re-homing of purebred Greater Swiss Mountain Dogs. 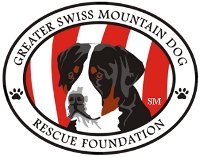 The Greater Swiss Mountain Dog Rescue Foundation is an all volunteer 501 C (3) non-profit trust committed to the rescue and successful re-homing of Swissies young and old. All Swissies in rescue are placed in foster homes prior to going to their forever home. It is the foster home's evaluation that assists us in placing each dog in what we feel is the most appropriate home. Our commitment to our rescues does not stop with their adoption. We have a great team of volunteers who have years of experience with Swissies who are willing to answer Swissy related questions for the life of the adopted Swissy. Any volunteer organization has to rely on the kindness and generosity of those willing to help. Whether it be in the form of a donation, fostering a dog, transporting or identifying a dog in a shelter, the Swissy community is very lucky to have such a dedicated group of volunteers who are always willing to step up. The GSMDRF could not function without the help of the many Swissy and non-Swissy owners who are always just a phone call away. If you are considering adding a Swissy to your family, please complete the pre-adoption application that can be found on this website. Swissies are still relatively small in numbers so please understand that your wait could be a long one.